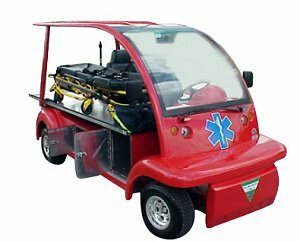 Perfect for any EMS or First Aid facility, college campus, or stadium application. Anywhere that electric power is desired ...in our parks, near our beaches or wherever fuel spills are a concern. Runs up to forty miles on a charge and has provisions for a medic to do whatever is necessary while en route.